Leucochloridium paradoxum is a parasitic flatworm which uses snails as a intermediate host and birds as the definitive host. These flatworms usually infect snails as juveniles via bird droppings. Once inside a snail they begin to mature in the digestive system. 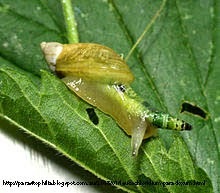 When they are nearly ready to reach adulthood the worm will move to the snails antenna, preferably the left antenna. It then reduces the light sensitivity in the snail so it spends More time out in the open making it easier prey for a bird. Their ultimate objective is to cause the snail to get eaten so they can reach adulthood and reproduce in their definitive host. Leucochloridium paradoxum is found in Northern and Central Europe.